Turn your kitchen into a Chinese restaurant. Why order take-out when you can order in! 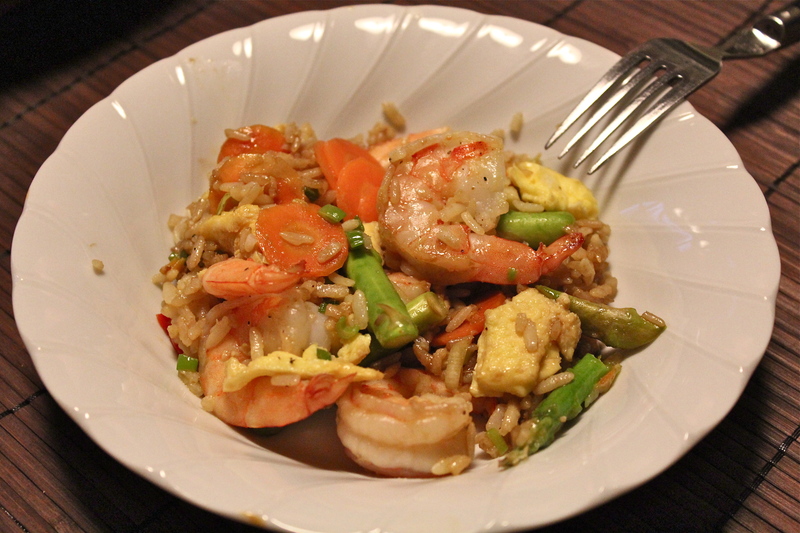 With this recipe you can make your own version of shrimp fried rice. Fried rice is typically made with rice that has been pre-cooked and allowed to cool so that it will fry and not steam when added to the other ingredients of the dish. So left over rice that is dried out is ideal. If that is not available, cook some rice in advance and let it become cold, and some what dry. 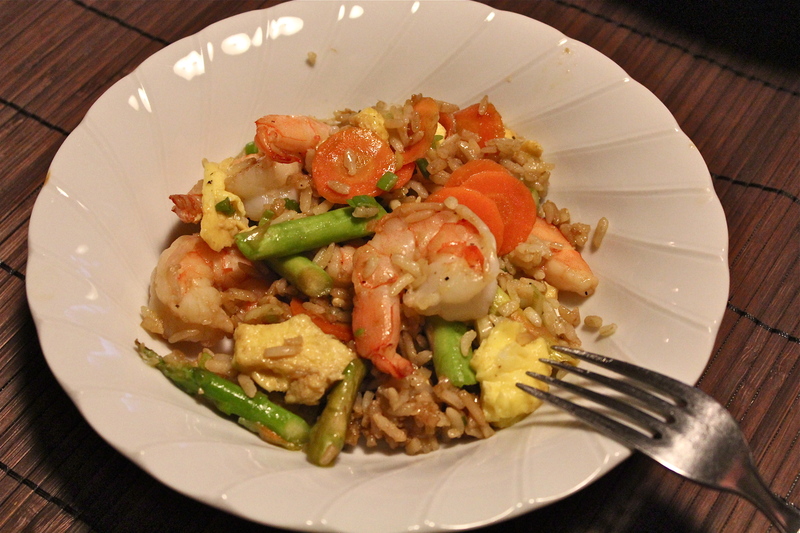 Shrimp, rice, egg, and lots of veggies. 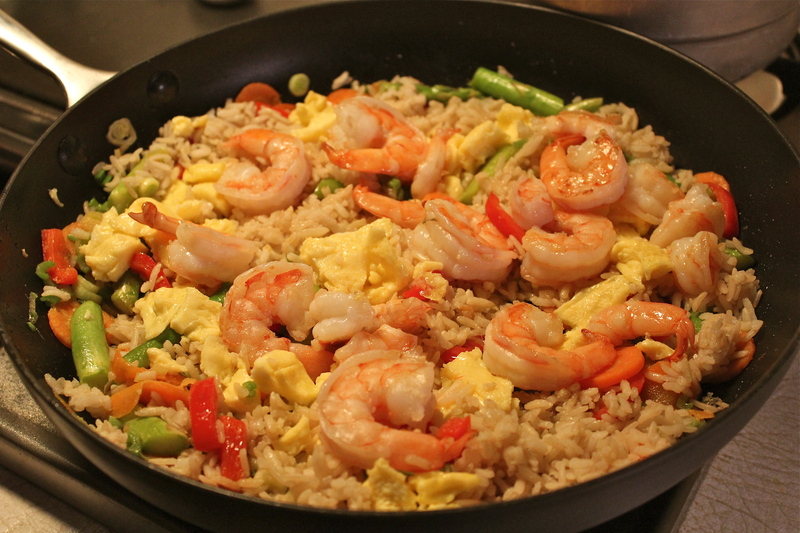 Fried rice usually includes eggs, meat or seafood, vegetables, peppers, spices and soy sauce. Extra flavor is gained by the addition of onions, scallions and garlic. A wok is the cooking utensil of choice but a large non-stick skillet works equally well. This shrimp fried rice is full of vegetables and makes 4 generous servings, so you’ll need a large skillet at least 12 inches wide or a large wok. 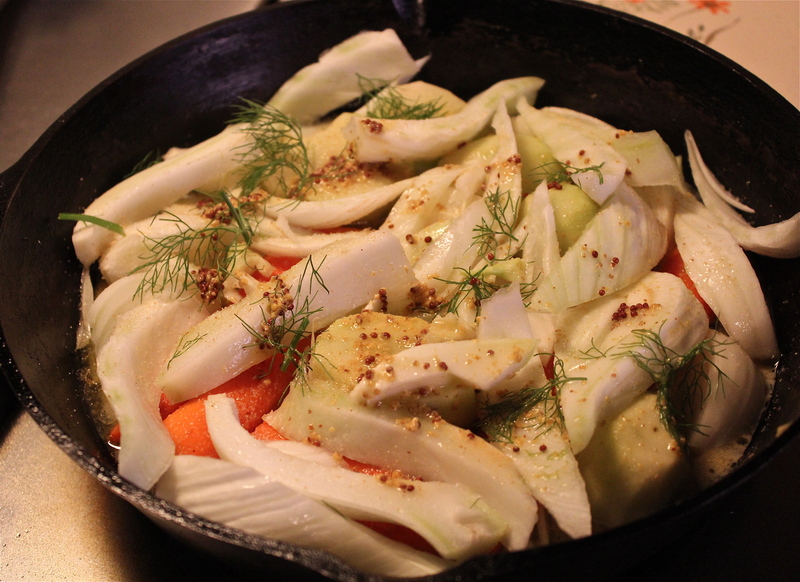 Be sure that you do not over cook the vegetables, they should be crisp-tender. Although the recipe states that it makes 4 servings, my husband and I were able to devour most of it with only a small dish left over. We loved it and I can’t wait to make it again. 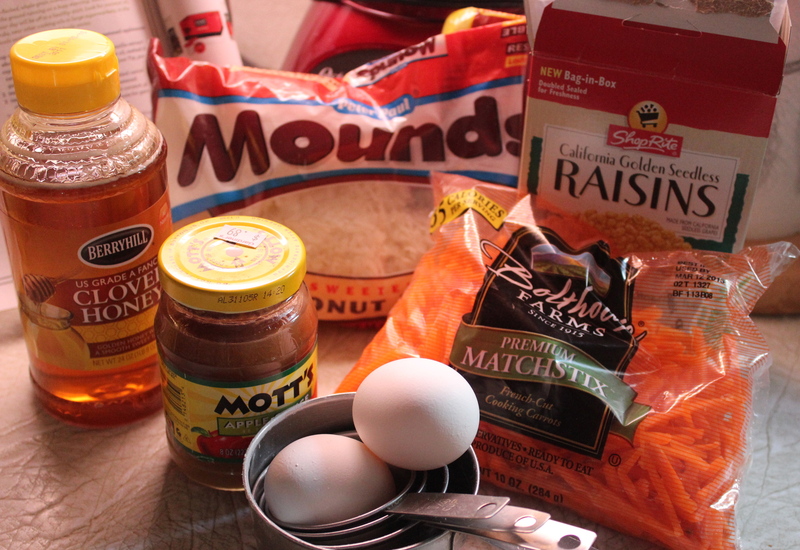 Have all ingredients prepped before starting to cook. 1. Combine water and rice in a medium saucepan. Bring to a boil over high heat. 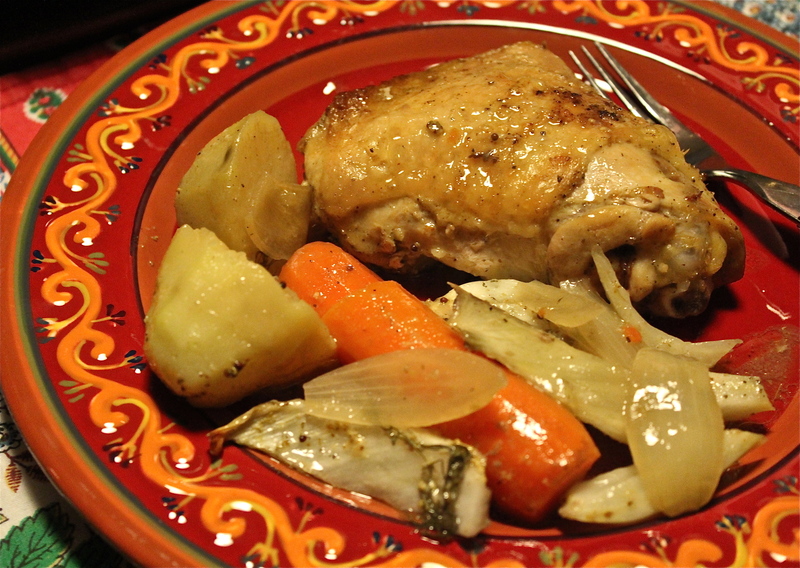 Cover, reduce heat to med.-low and simmer until water is absorbed, 10 – 12 minutes. Allow to cool, but stir occasionally to prevent clumping. Spreading the rice out on a baking sheet is helpful in cooling it quickly and preventing it from clumping. 2. Combine hoisin sauce, soy sauce, and sesame oil in a small bowl. Set aside. 3. Heat 1 teaspoon canola oil in a large non-stick skillet over medium-high heat. 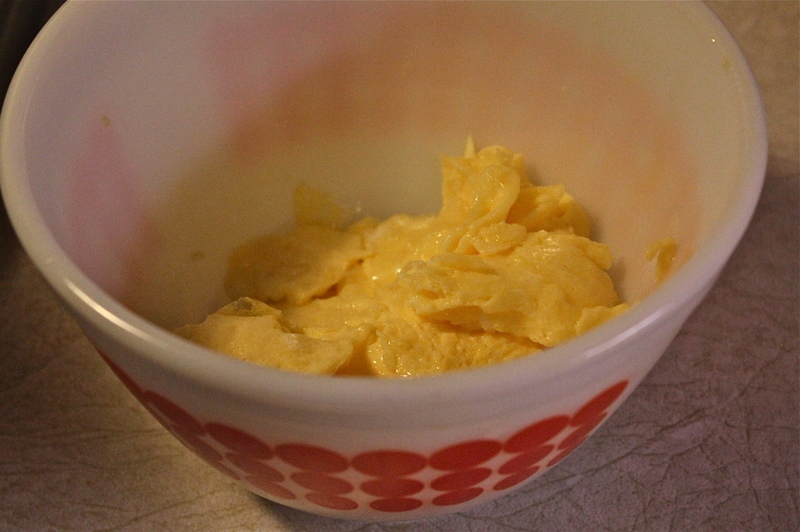 Add eggs and cook, stirring to help break into smaller pieces, until just set, about 45 seconds. Transfer to a small bowl. Eggs cooked just until set. 4. Add another 1 teaspoon canola oil to the skillet and return to medium-high heat. 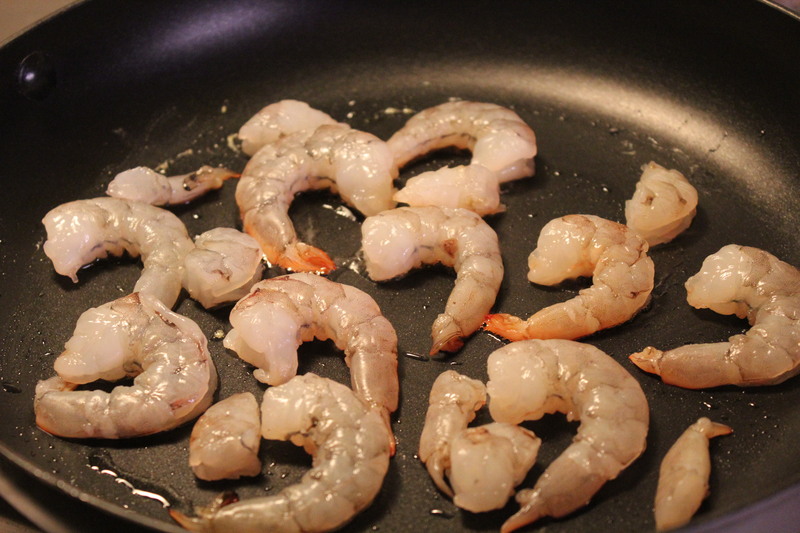 Add shrimp and cook, stirring occasionally, until pink 1 1/2 – 2 minutes. Transfer to a plate or bowl. 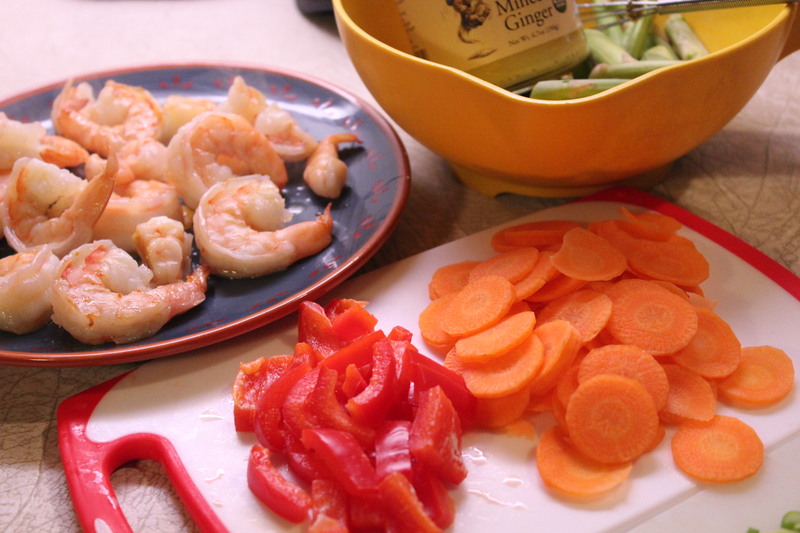 Saute shrimp until pink and just cooked. 5. Heat the remaining 2 teaspoons canola oil in the skillet over medium-high heat. Add ginger and cook, stirring, until fragrant, about 30 seconds. 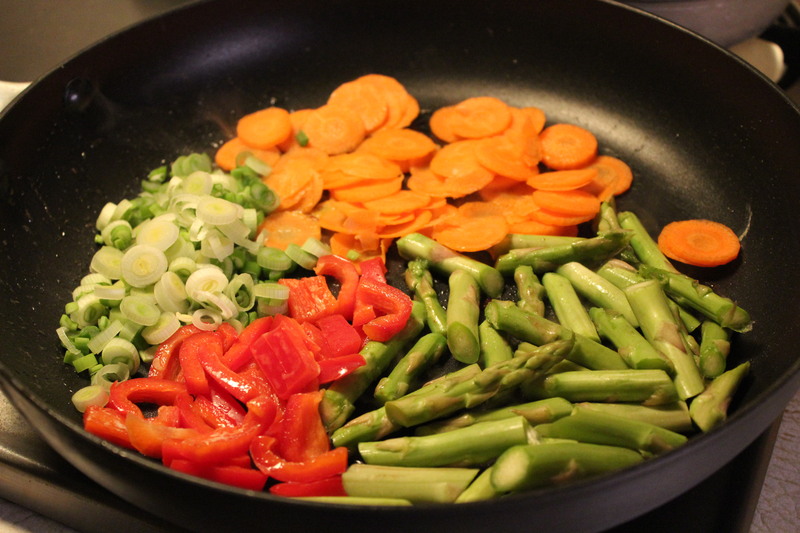 Stir in snap peas, bell pepper, carrots, and scallions; cook stirring, until tender-crisp, 3 – 4 minutes. A colorful combinations of vegetables. 6. Stir in the rice and the reserved egg and shrimp; cook, stirring until heated through, about 1 minute. Gently stir in the sauce mixture and remove from the heat. Add in rice, shrimp and egg. 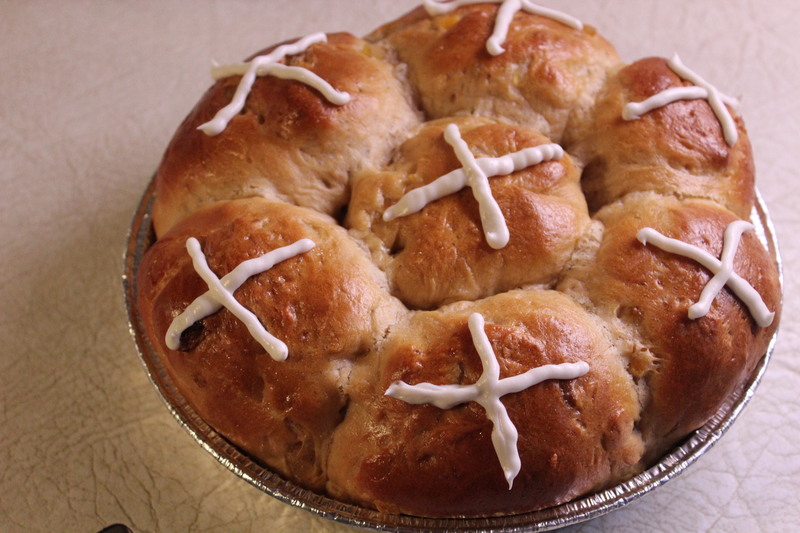 A hot cross bun is a spiced sweet bun made with currents or raisins and marked with a cross on top, traditionally eaten during Lent, but especially on Good Friday. 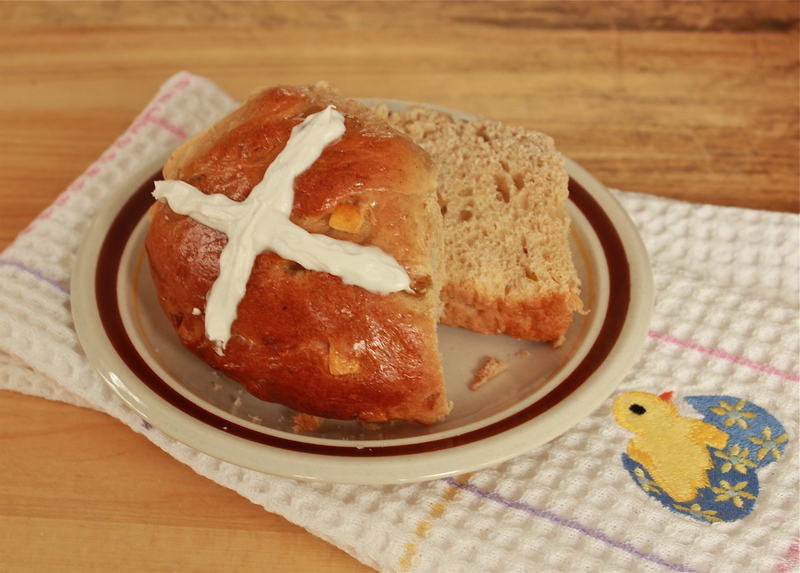 There are many superstitions associated with hot cross buns. “One of them says that a piece given to someone who is ill is said to help them recover. Because there is a cross on the buns, some say they should be kissed before being eaten. 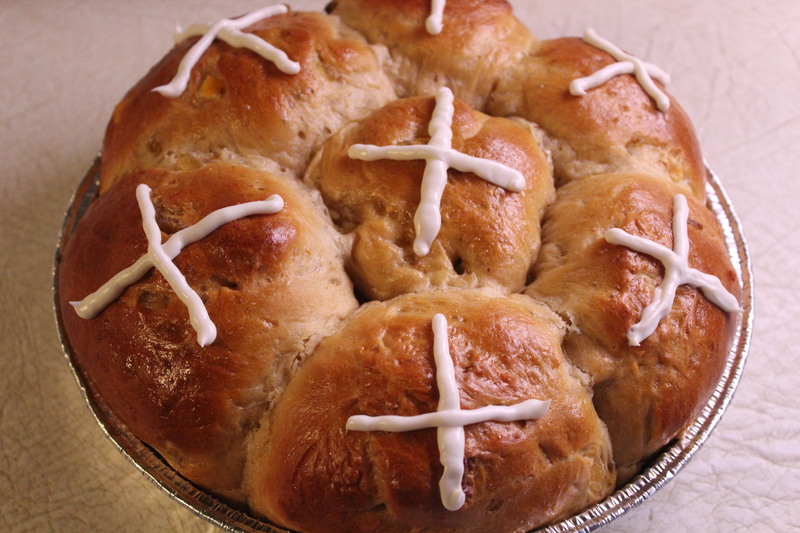 If taken on a sea voyage, hot cross buns are said to protect against shipwreck. If hung in the kitchen, they are said to protect against fires and ensure that all breads turn out perfectly. The hanging bun is replaced each year.”** HaHa, I guess it would need to be! Tall, pillowy, and delicious, I’m sharing it with you! Another saying that I particularly like says that sharing a hot cross bun with another person is supposed to ensure friendship throughout the coming year. 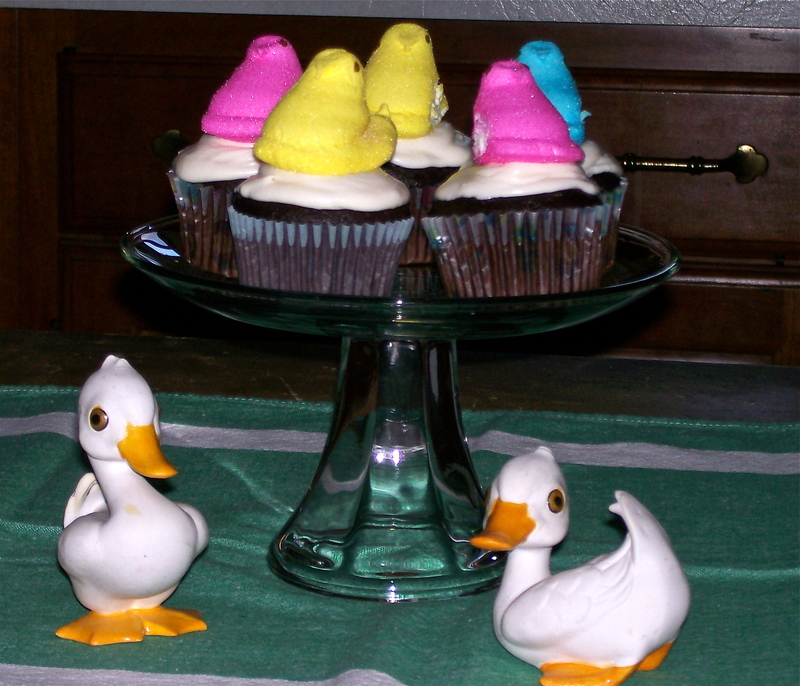 By sharing this recipe with all of you I hope that we will continue to be “friends” in the coming year as I am coming up on my one year anniversary of writing this blog on March 31. 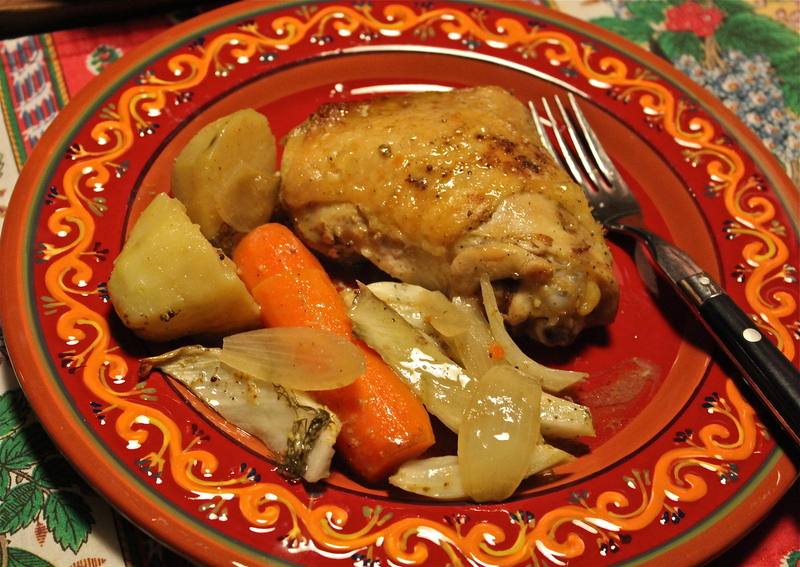 I value all of you who read this blog and all who have decided to follow me as I continue to write about my cooking adventures, some with fantastically good results (like this recipe, I think), and others with somewhat less than stellar results. But that’s why I blog; to share it all–the good, the bad, and the in-between. If you have seen or purchased hot cross buns at the supermarket you know that they are smallish round buns, with the white cross on top. I, personally, find them to be quite dry, sometimes overcooked, and practically tasteless. The ones you can make at home are so much better there really is no comparison. 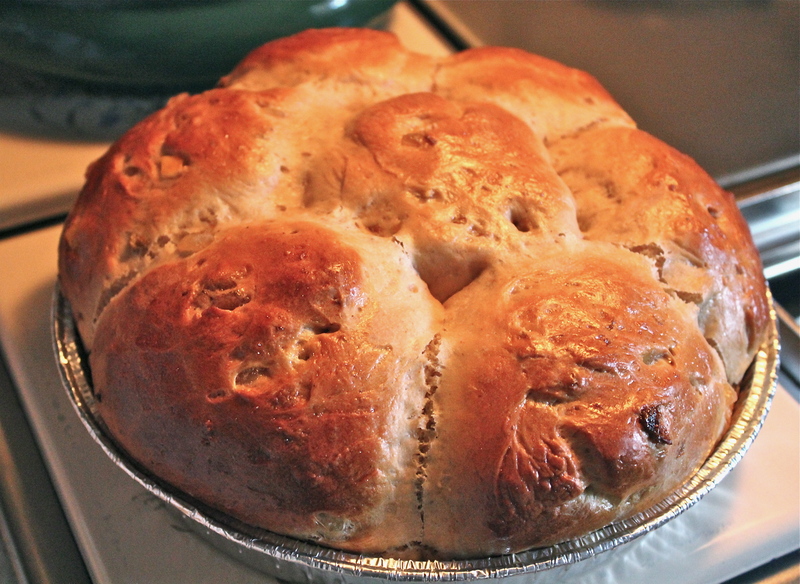 Yes, they take a little time because they are a yeast dough, but if you have a bread maker it is so easy, you will wonder why you haven’t made them before. 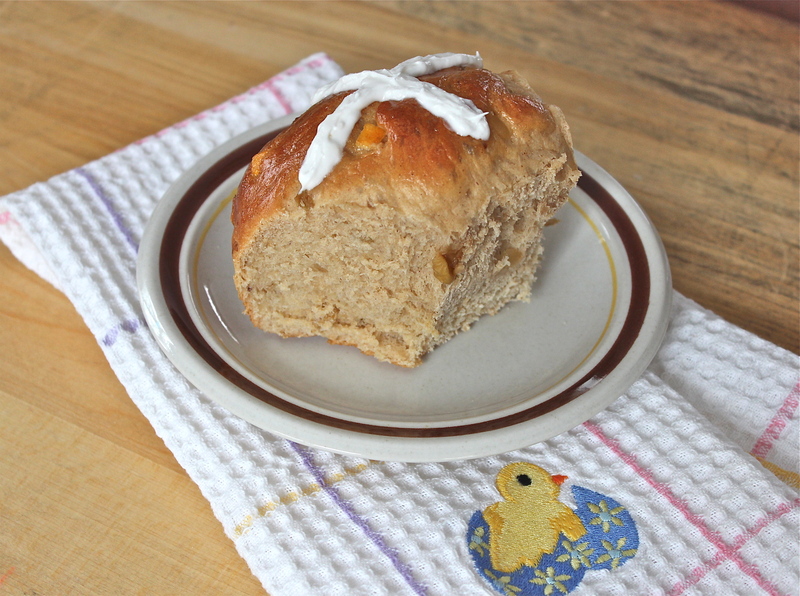 This recipe is one that I got from King Arthur a few years ago and since I first made them I don’t deviate or make alterations because they rise so well and once baked make a light, tender, pillowy, bun with an aroma that is unbelievable. The flavor is derived from the spices that go into the dough, but also from a flavoring called Fiori di Sicilia, an all-natural citrus- and vanilla-scented flavoring. It is available through the King Arthur Baker’s Catalog. 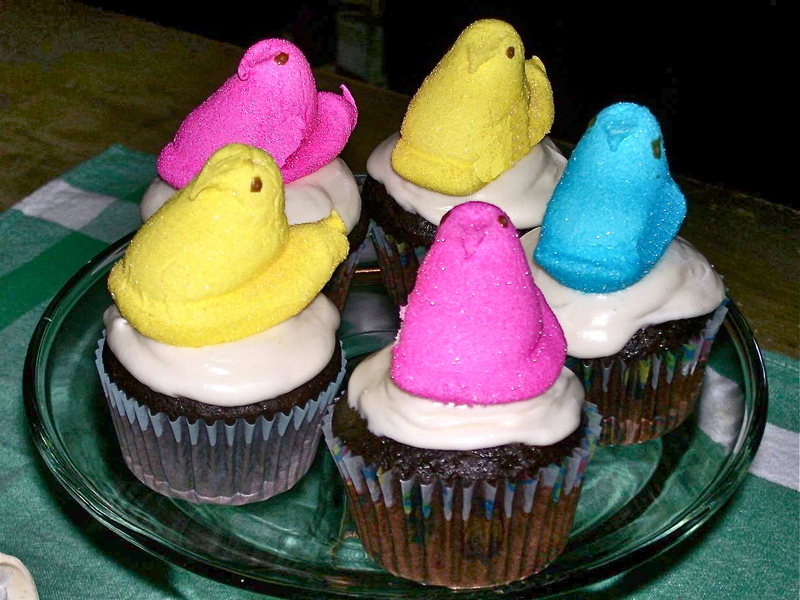 In its absence you could use a little vanilla, and either lemon or orange flavoring, and they would still be fantastic . 1. Mix the rum or apple juice with the dried fruit and raisins, cover and microwave briefly, just till the fruit and liquid are very warm. In my microwave this would be 1 minute at 50% power. Set aside to cool to room temperature. While this is cooling you can be mixing up the remainder of the recipe, because the fruits go in at the end. 2. 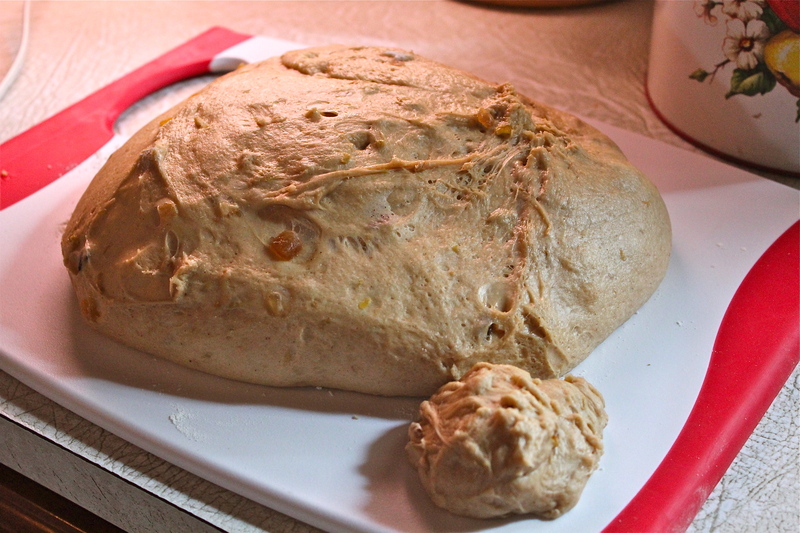 Mix together all of the dough ingredients except the fruit, and knead, using an electric mixer or bread machine, till the dough is soft and elastic. Mix in the fruit and any liquid not absorbed. This is what I do: Following instructions for your bread machine layer in the liquid ingredients first, followed by the flour mixture ( i.e. 4 1/4 cups flour plus all the spices, brown sugar, salt and baking powder) Make a depression in the top of the flour and pour in the yeast last. Start the bread machine on the dough cycle, and let it mix up everything. When it is almost at the end of the mixing phase, add the fruits and any liquid. Check soon after to see if the dough looks too wet, and add the remaining 1/4 flour if it needs it. Allow the machine to finish the dough cycle till it has risen. Proceed with step 4. 3. Let the dough rise for 1 hour, covered. It should become puffy, though may not double in bulk. 4. 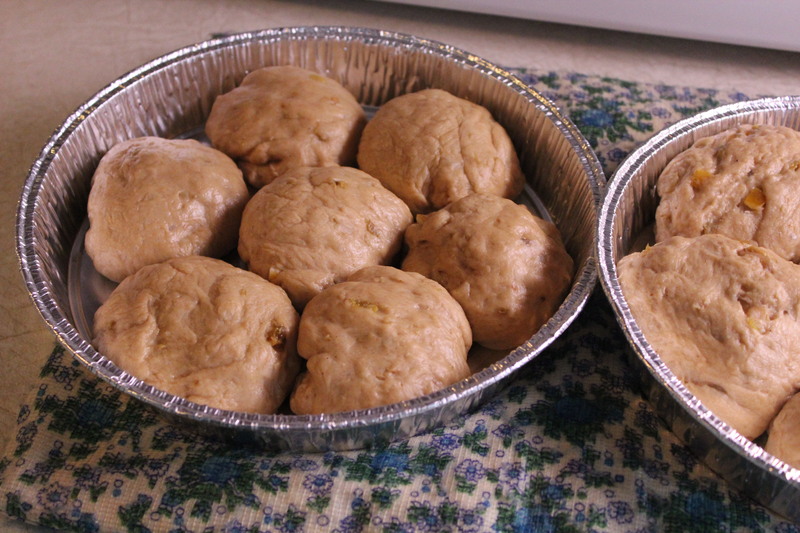 Remove the dough to a floured surface and divide the dough into ball-sized pieces, about 3 3/4 ounces each. 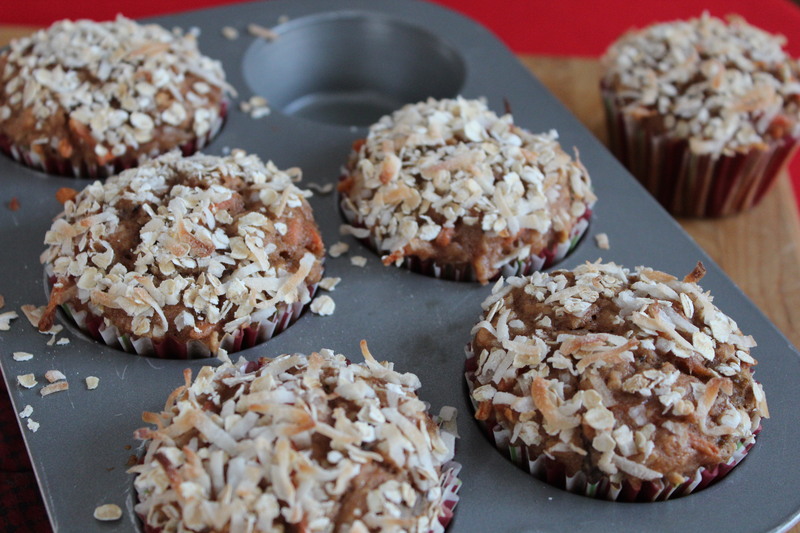 A 1/3 measuring cup or muffin scoop makes about the right portion. You should make about 14 buns. Greasing your hands helps with handling the dough and shaping into balls. 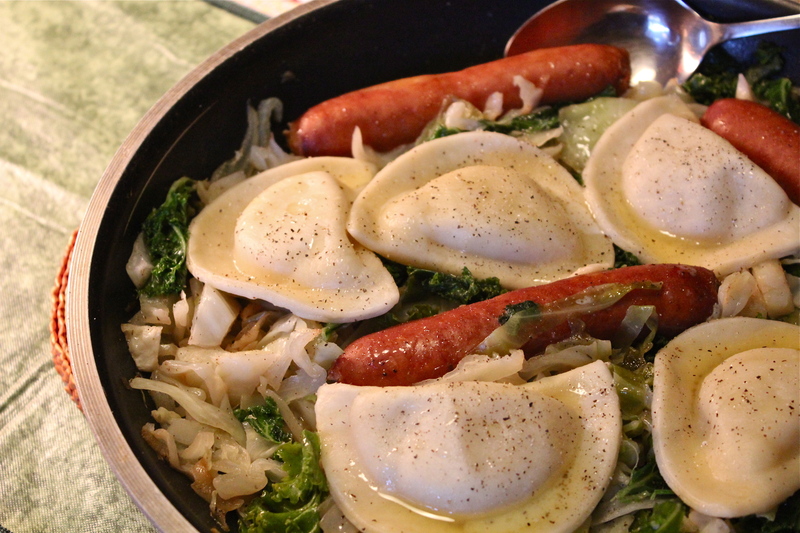 Arrange them in greased pans. Suggested pan sizes include 10″ square, 9″ x 13′, or two 9″ round cake pans. 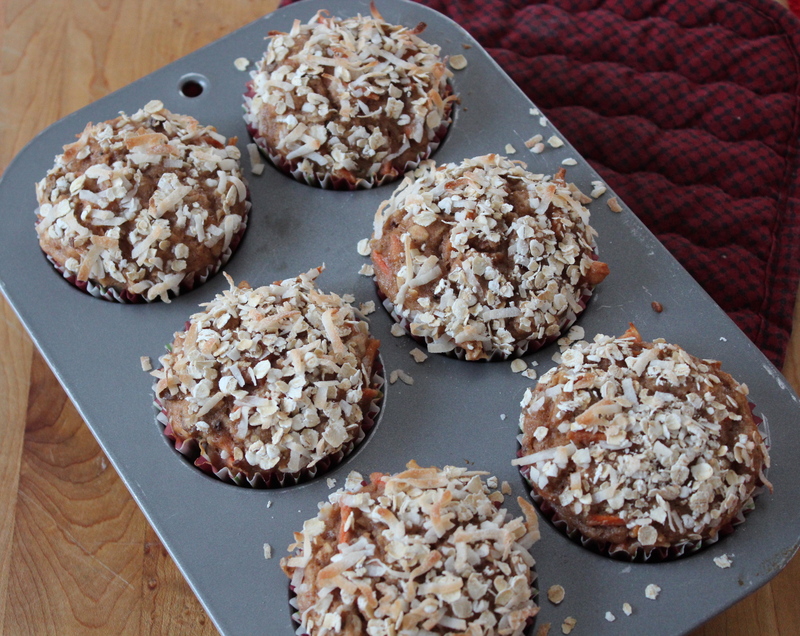 The cake pans were a good choice for me allowing for 7 buns in each (see picture), as I gave away one pan of buns. Seven buns in each cake pan. 5. Cover pan(s), and let the buns rise for 1 hour, or until they’ve puffed up and are touching one another. While the dough is rising, preheat the oven to 375*F. I have had good success with putting my pans on top of a heating pad set to “low”. The consistent temperature gives a high rise, and the baking powder in the dough gives it another boost in the oven as they bake. I think this is what makes these buns so light and pillowy. 6. Whisk together the egg white and milk, and brush it over the buns. This gives the buns a nice shine when baked. 7. Bake the buns for 20 – 22 minutes, until they are golden brown. Check internal temperature with an instant read thermometer. Temperature should be 160 degrees. 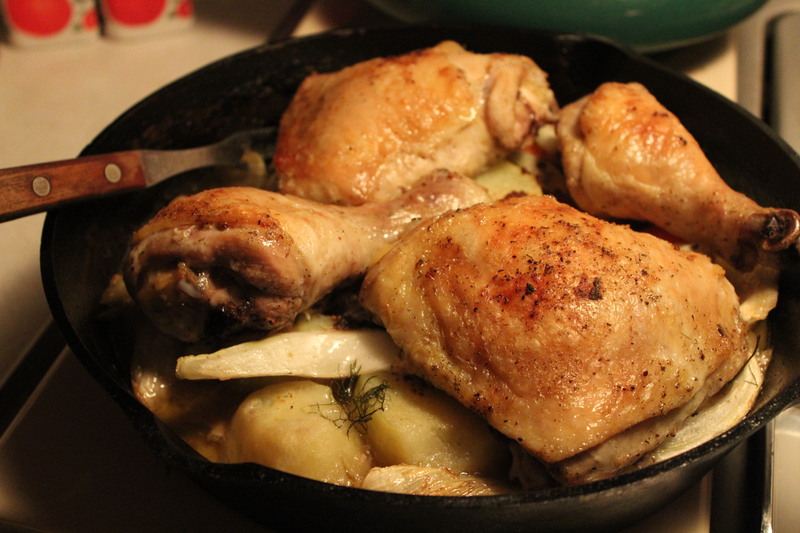 Some people have reported that the buns in the center of the pan may be a little doughy still at 20 minutes. Remove from the oven, and transfer to a rack to cool. 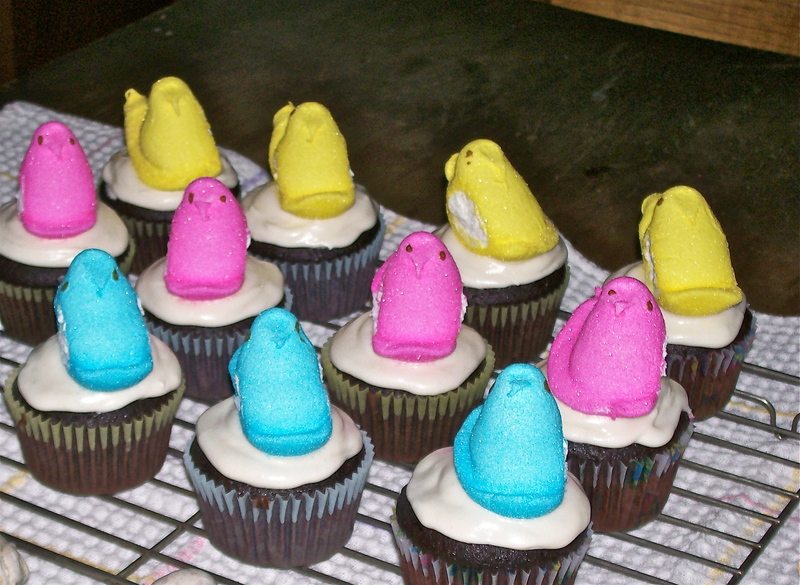 Note how high they rise and the shiny tops from the egg wash.
8. 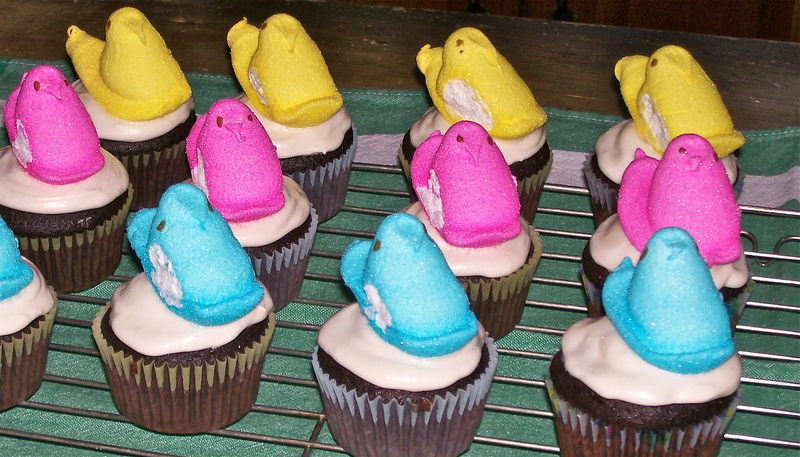 Mix together the icing ingredients, and when the buns are completely cool, pipe it in a cross shape atop each bun. Pipe crosses on top when they are cool. Throughout this Lenten season I’ve been trying to cut back on the amount of meat we consume, incorporating more fish and other seafood, or going completely meatless. Today’s recipe features a one-pan entree where eggs and cheese provide the main protein, and meaty mushrooms and leeks provide the vegetables. A frittata is is an egg based dish, somewhat like a quiche without a crust, a little like an omelet only baked. 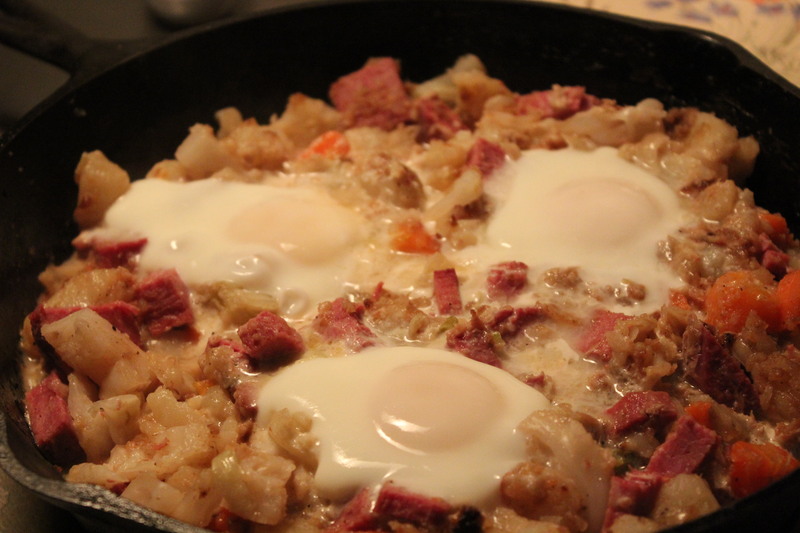 Hard to describe, but if you like eggs in any form you can’t miss with this dish. Frittatas are eggs-cellent served hot or at room temperature, which means you can do it ahead. It would be a great addition to brunch, make a light lunch, or a meatless main meal served with another vegetable and a salad as I did. In the version you see pictured here I made only half the recipe for two of us, and we had about half of it left for another time. Also the recipe calls for Baby Bella mushrooms, but I used Shitaki mushrooms. I would not do that again as they do not have enough natural moisture for this kind of recipe. Shitakis need to be cooked in a liquid in order to become tender, so I found that in this recipe they were a little tough. 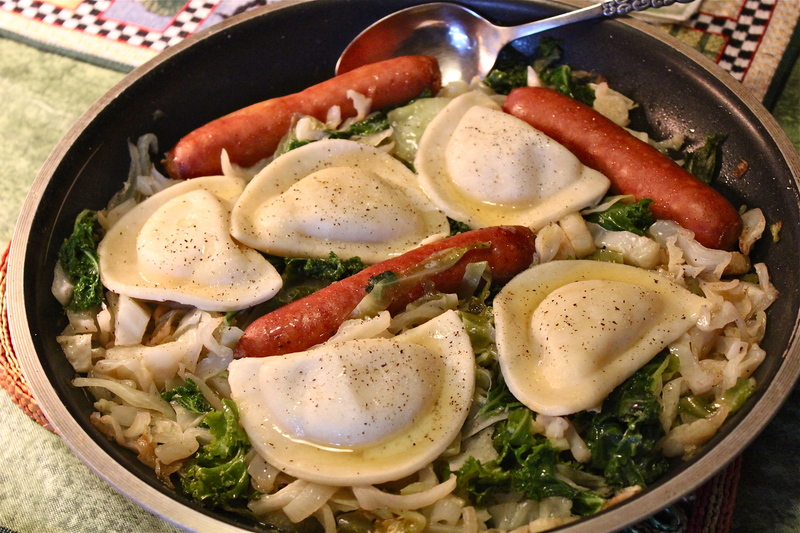 Fontina is the suggested cheese to use here because it has a mild flavor and excellent melting properties. A good substitute would be muenster or edam cheeses. 1. 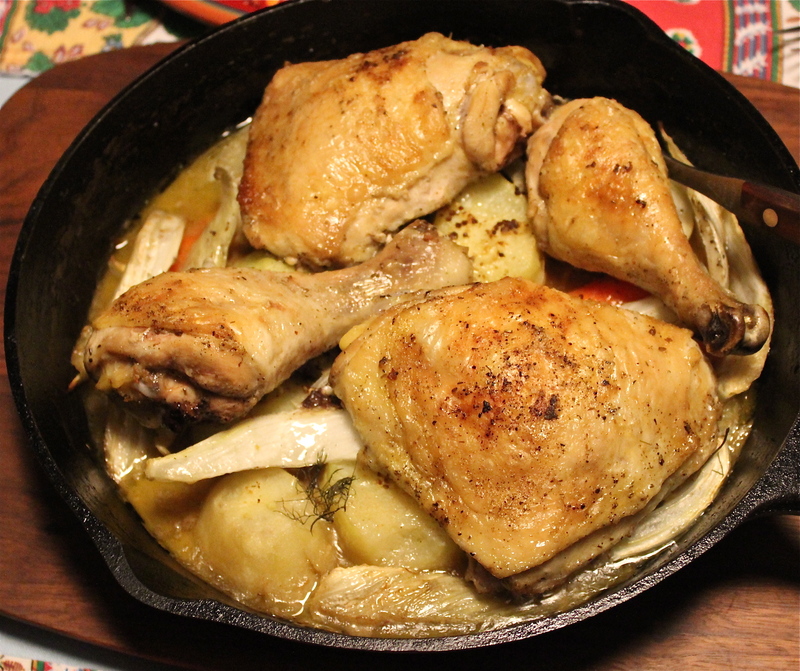 Preheat oven to 350*F. Heat 1 Tablespoon olive oil in a 10 – inch heavy weight oven proof skillet such as cast iron. 2. Add leeks to the hot oil and cook over medium heat, stirring often until softened, about 5 minutes. 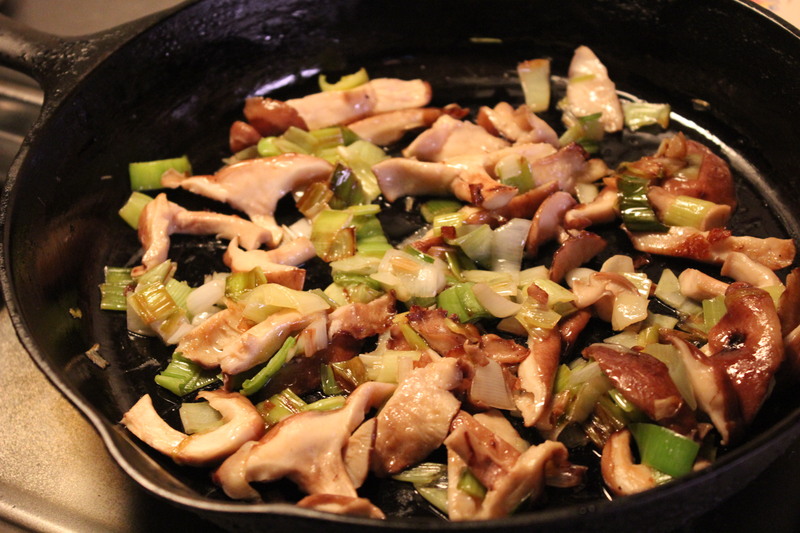 Add mushrooms and cook until softened and all liquid has evaporated, 8 – 10 minutes. Sautee the leeks and mushrooms. 3. 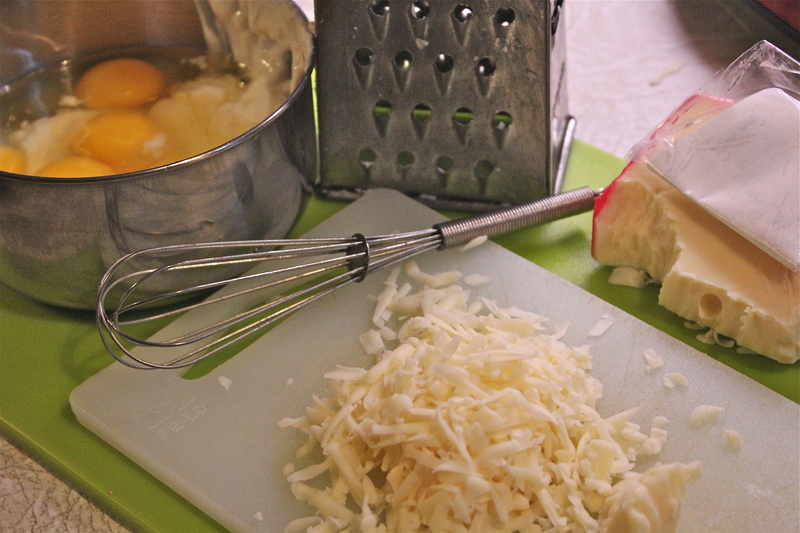 Meanwhile, whisk eggs, creme fraiche or sour cream, and parsley in a large bowl; mix in 1/2 cup cheese. Season with salt and pepper. 4. 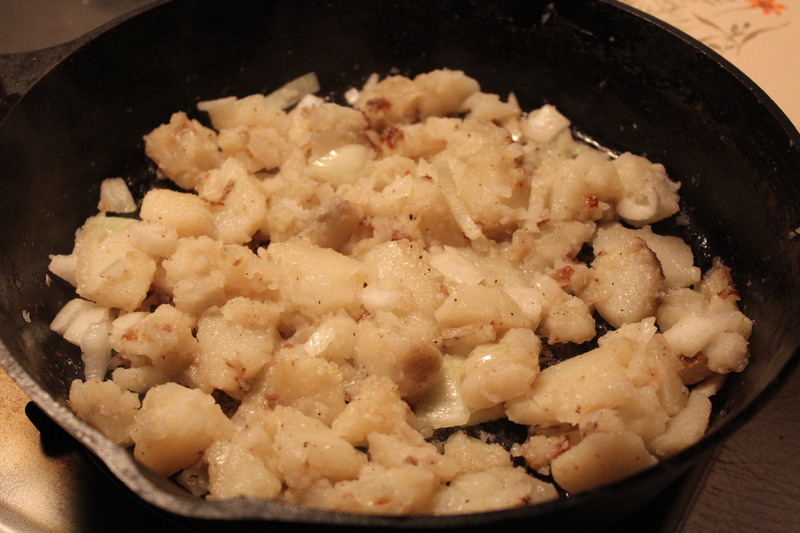 Increase heat to medium-high and add remaining 1 Tablespoon oil to the skillet. 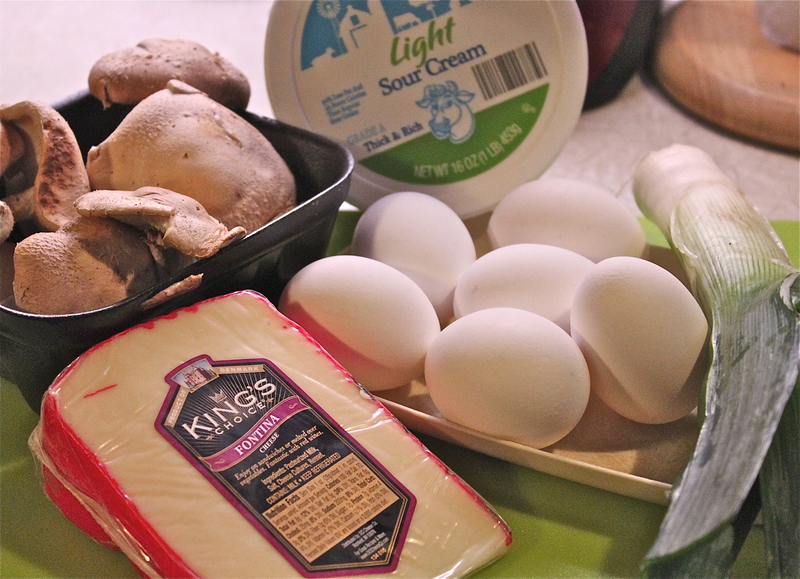 Pour the egg mixture over the mushrooms, shaking the pan to evenly distribute the mixture. 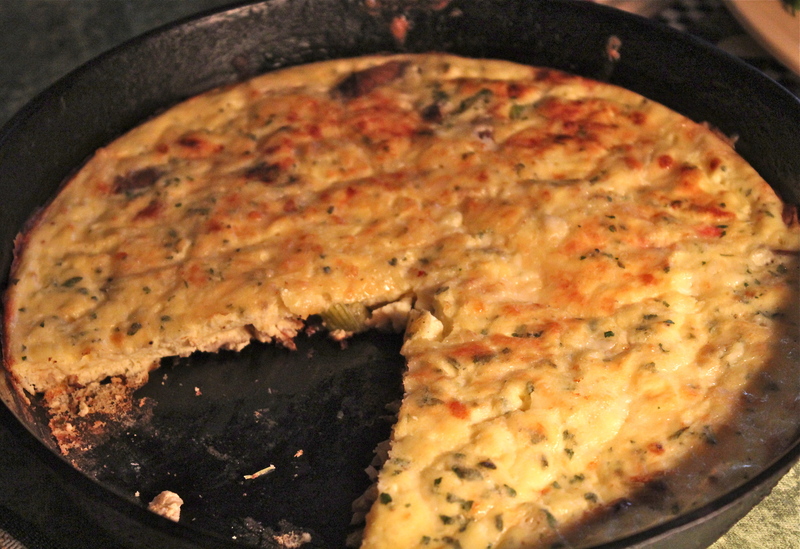 Cook the frittata, without stirring, until its edges begin to set, about 5 minutes. Cook until the edges just begin to set. 5. 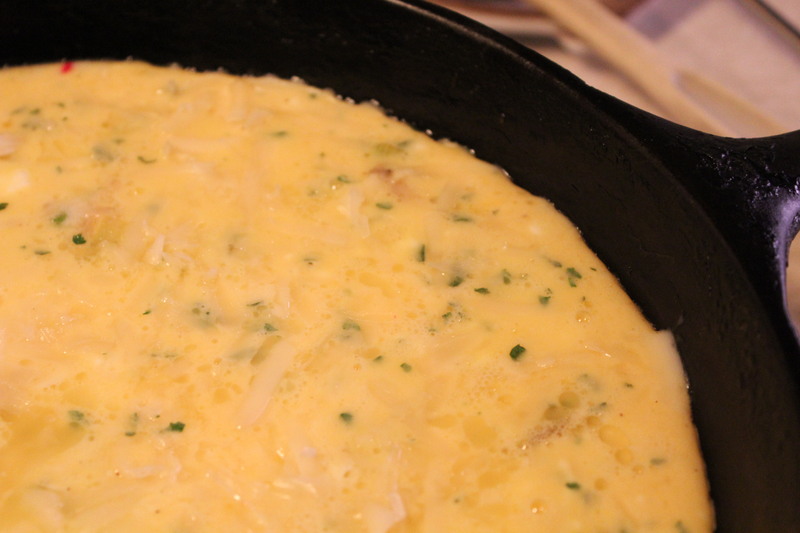 Sprinkle remaining 1/4 cup cheese over eggs and transfer skillet to oven. 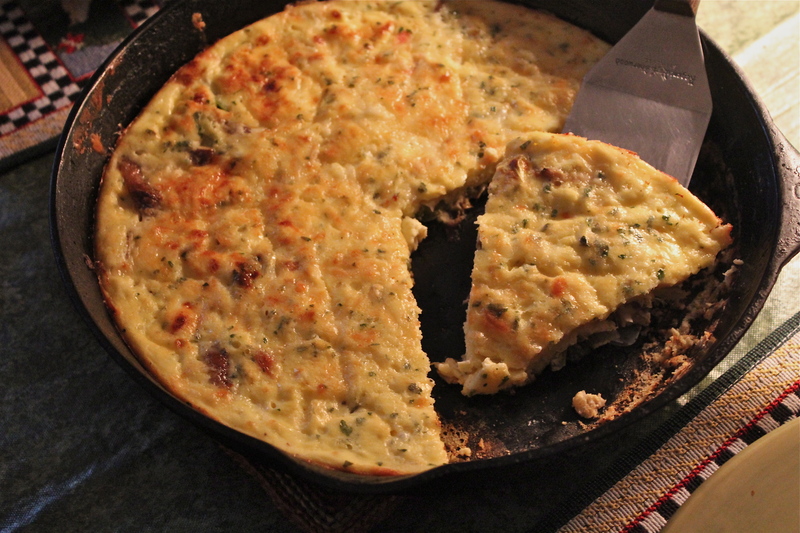 Bake frittata until golden brown and center is set, 25 – 30 minutes. I have a confession to make—I don’t like foods that are hot and spicy. However my husband LOVES that kind of food. A dilemma of hugh magnitude when you are the cook and there is only the two of you to cook for. Which one to please? 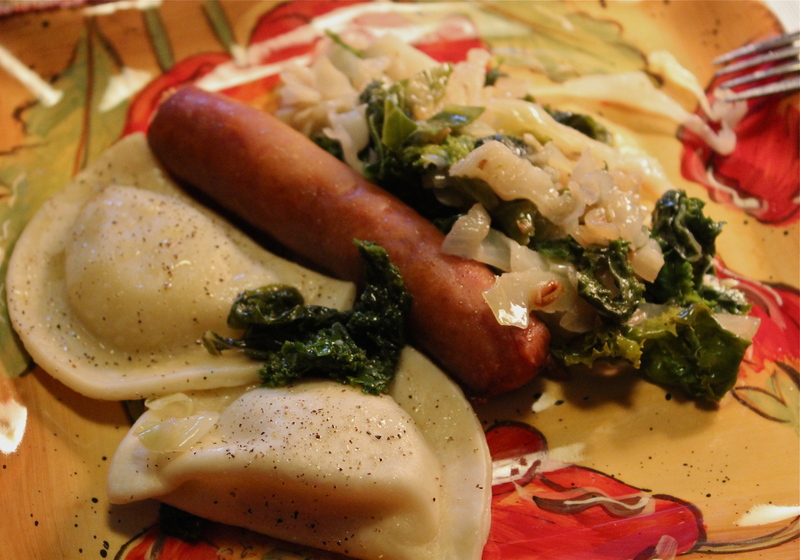 Well, being the cook has its privileges, so I’m the one who gets the kind of food I like most of the time. Don’t get me wrong Mr. D. is always happy and complimentary of what I cook, but what I’m saying is that I don’t go out of my way to make a dish especially for his tastes when I know that I won’t like it. This recipe, then, is a first. I made it especially for him. I had something else lined up for me to eat because I was prepared not to like it. Surprise!! I liked it. 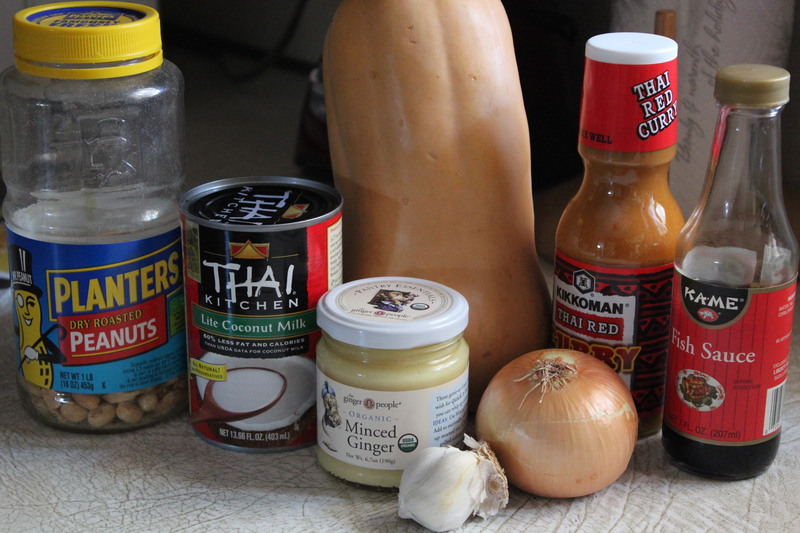 I had never cooked with red curry paste before and I expected it to be hot and spicy. However that was not the case and this soup turned out to be quite mild. You can certainly “turn up the heat” if that is your taste, by adding more curry paste, or a little Sriracha sauce. I also found that the squeeze of lime into your bowl is necessary for a little tang. 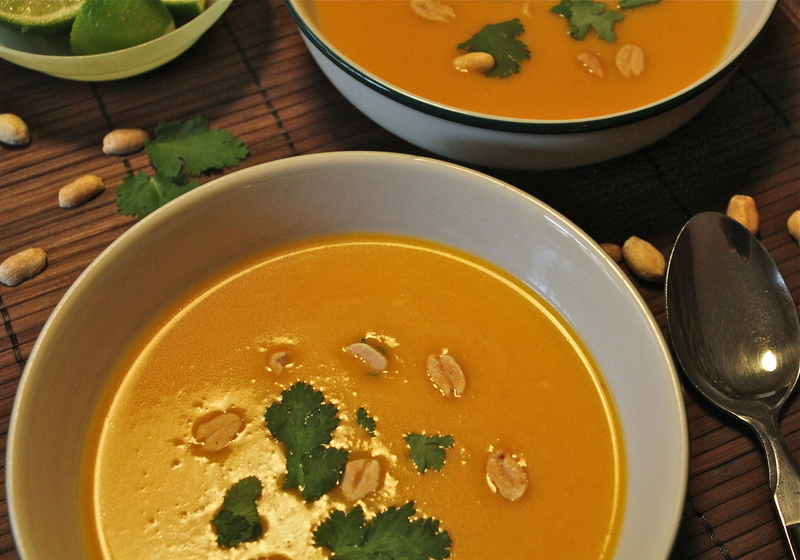 ** If you can’t find frozen pureed squash, you can make this soup with 4 cups cubed butternut squash. Just add some additional cooking time–about 10 minutes–in step 2. That is what I used to make the recipe. 1. Heat a medium saucepan over medium-high heat. Add oil; swirl to coat. Add onion; sauté 3 minutes. Add curry paste, garlic, and ginger; sauté 45 seconds, stirring constantly. 2. Add broth and next 5 ingredients ( through salt ); cover. Bring to a boil. Reduce heat, simmer 5 minutes,( or 15 minutes if using fresh squash) stirring frequently. Puree the soup mixture with an immersion blender, or in batches with a standard blender. Blend until smooth. 3. 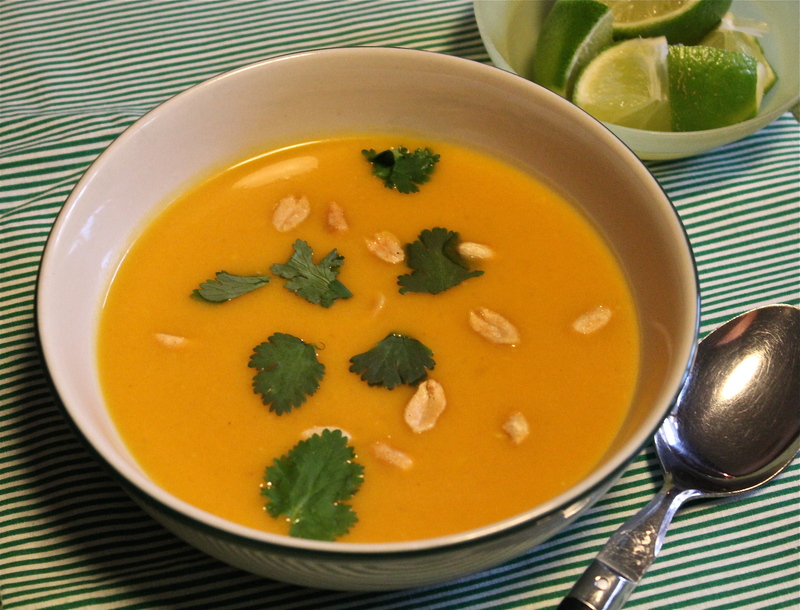 To serve: Ladle about a cup into each of 4 bowls; top with 2 tablespoons peanuts and 1 tablespoon cilantro. Serve with lime wedges. 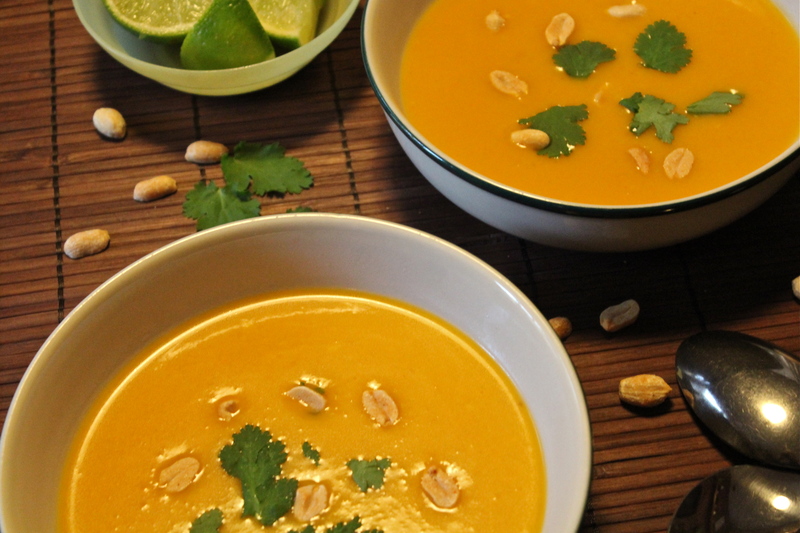 Serve with peanuts, cilantro, and a wedge of lime. Oh, Yes! This was very good and we both liked it. Velvety smooth and creamy, but not too thick. 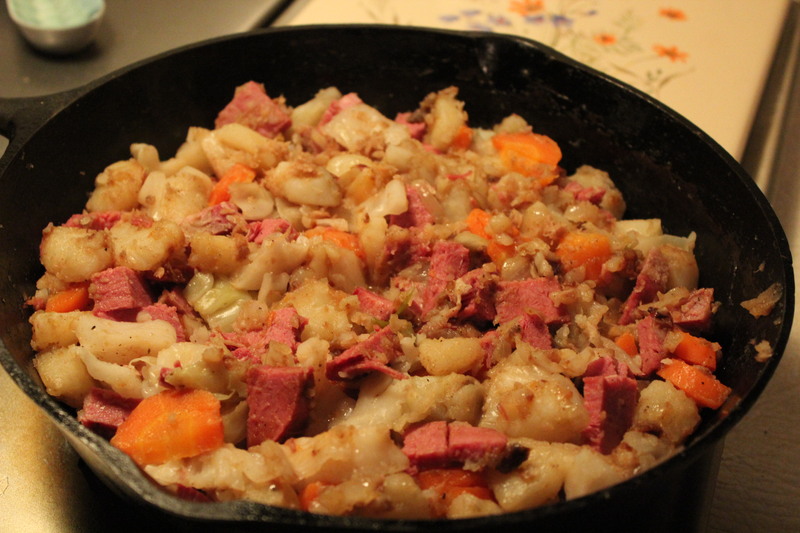 With yesterday being St. Patrick’s Day, I cooked the traditional meal of corned beef, cabbage, potatoes and carrots. 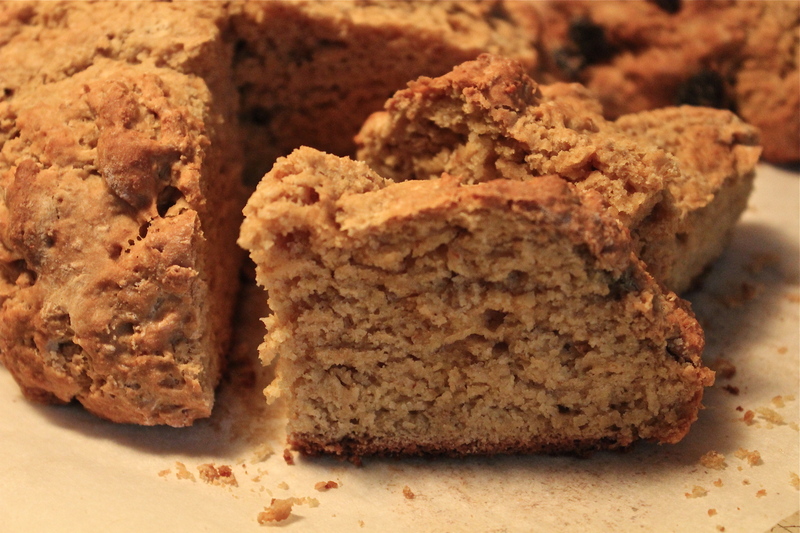 and along with it I made this recipe for Irish Brown Bread. 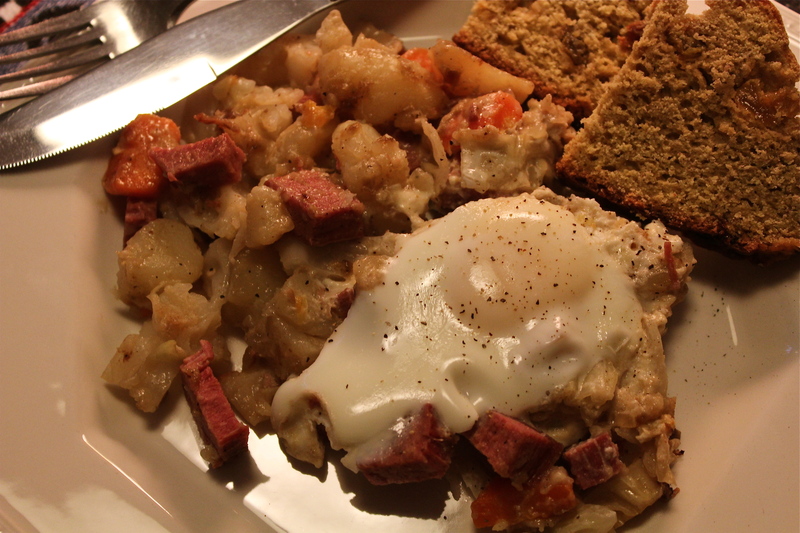 Neither Mr. D. nor I have a drop of Irish blood in us, yet we love this meal and I always make it for St. Paddy’s Day. 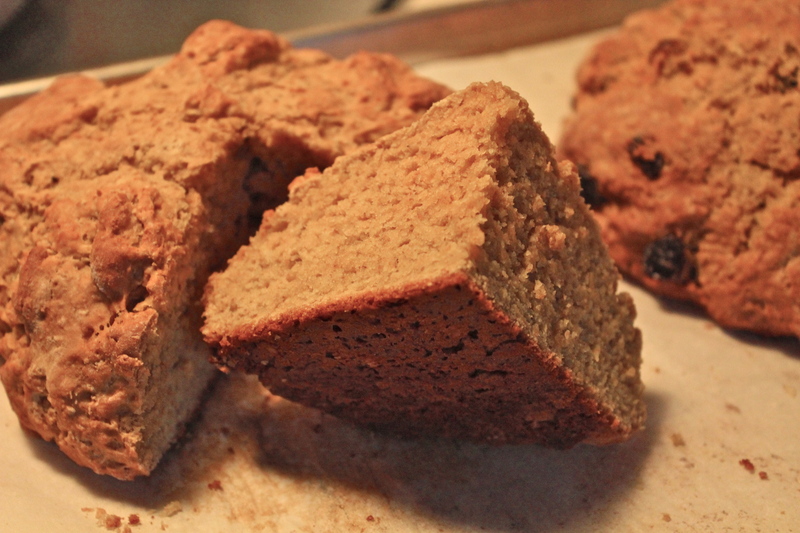 This bread is not the usual soda bread that is frequently served with this meal, but more closely resembles the soda breads made in Ireland back in the day when such things as caraway seeds and raisins were too costly for ordinary folks to afford. Enjoy it with a cup of tea and some fruit for an afternoon snack. 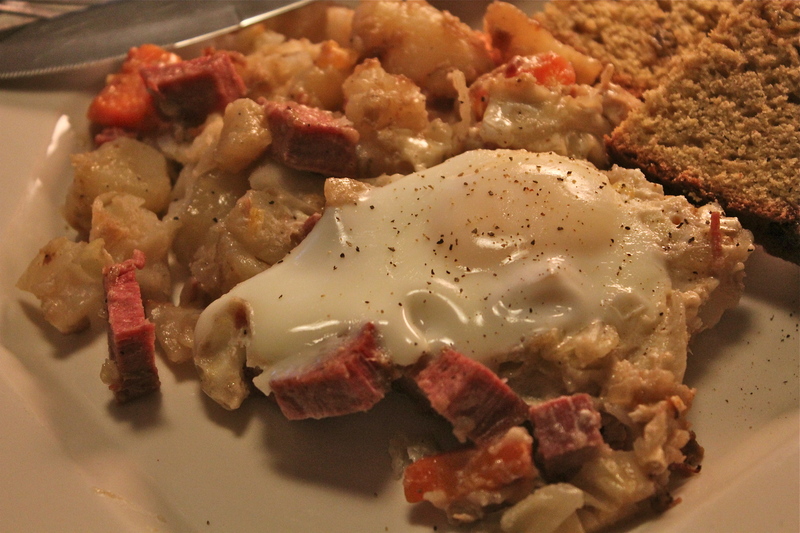 My recipe comes from a gentleman named Brian O’Rourke who is the owner of O’Rourke’s Diner in Middletown, Ct. This old-time diner is a fixture on Main St and has been there for years. 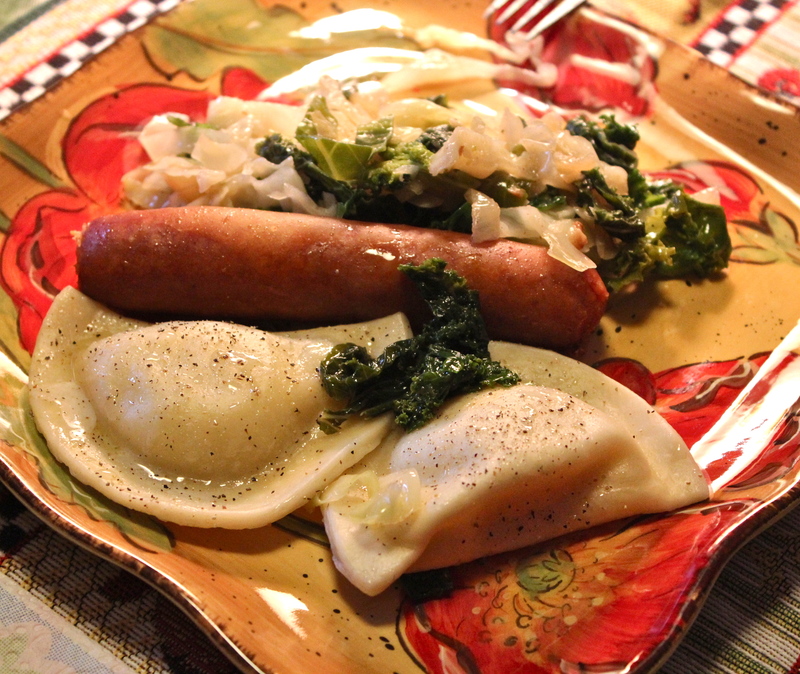 It has been featured on the Food Network’s Diners, Drive-Ins and Dives. It is only open for breakfast and lunch, and on weekends there is always a line of people out onto the sidewalk and up the street waiting to get in. When you are finally seated it is hard to chose your order because everything Brian cooks is so scrumptious. He is a very generous man when approached by any group or organization for fund raisers; and so when the diner was severely damaged by a fire a few years ago the people of Middletown held fund raisers for Brian to help him rebuild the business. When one of the local churches was putting together a cookbook of local, favorite recipes this is the one that Brian contributed. 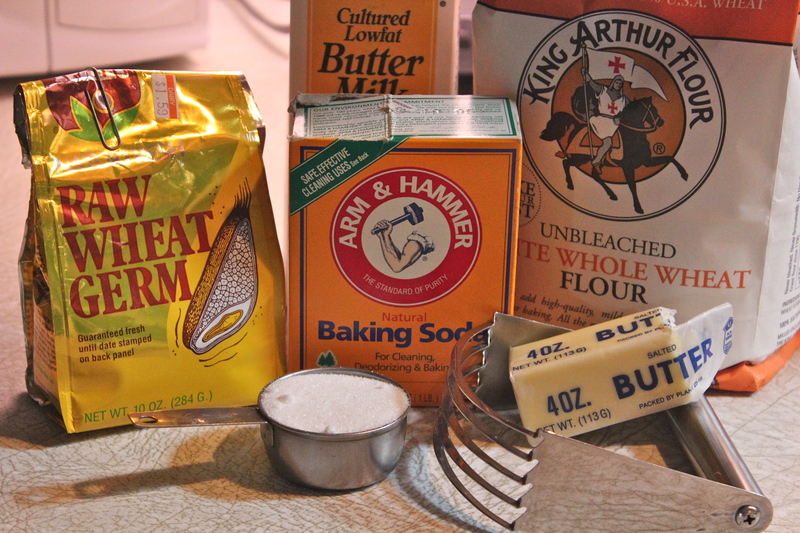 Just a few ingredients with baking soda being a prominent one. 1. In a large bowl combine flours, bran, sugar, salt, baking soda and baking powder and mix well with a whisk. 2. Cut in butter until mixture is crumbly. 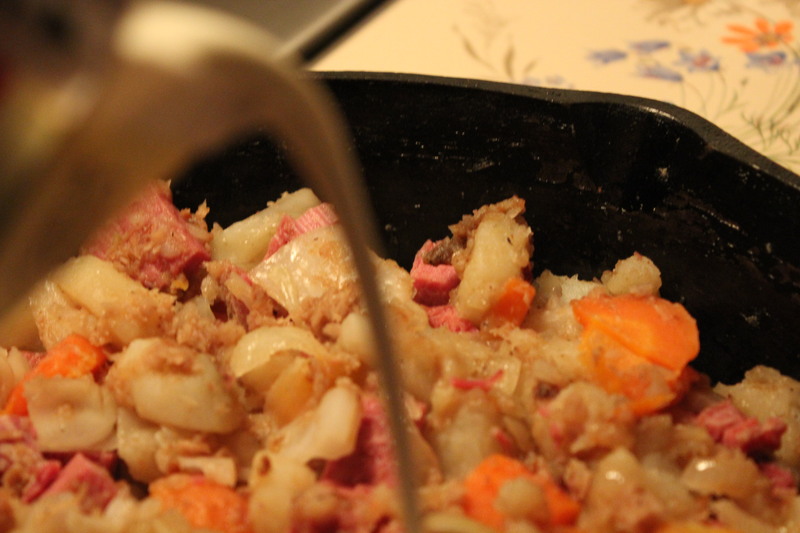 Stir in buttermilk and mix until dry ingredients are moistened. Do not over mix. 3. 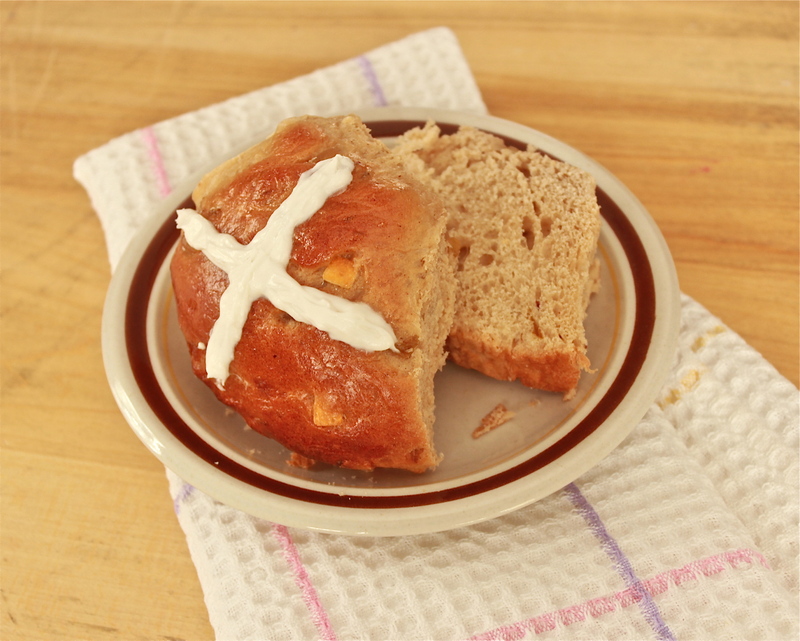 Shape dough into two round loaves and cut a cross in the top of each one. This allows for expansion. Place on a greased or paper-lined baking sheet. 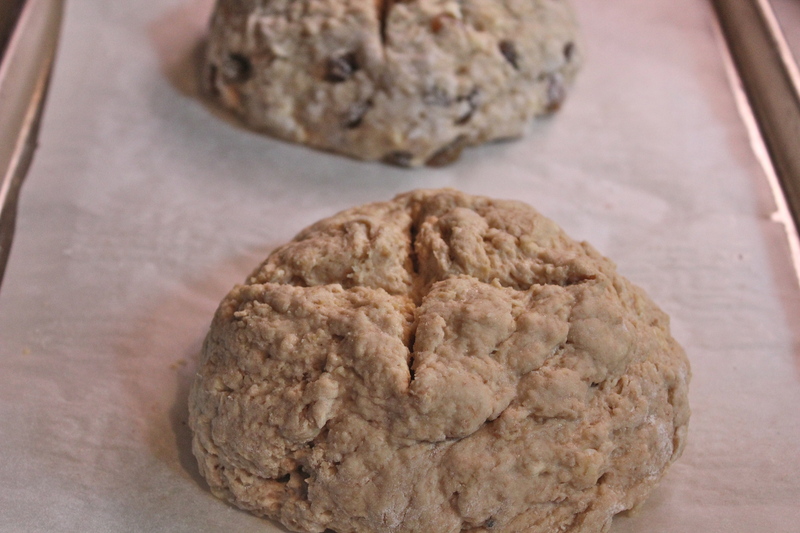 Shape dough into two round loaves. Bake at 375*F for 40 minutes. Fresh out of the oven, crusty and warm. 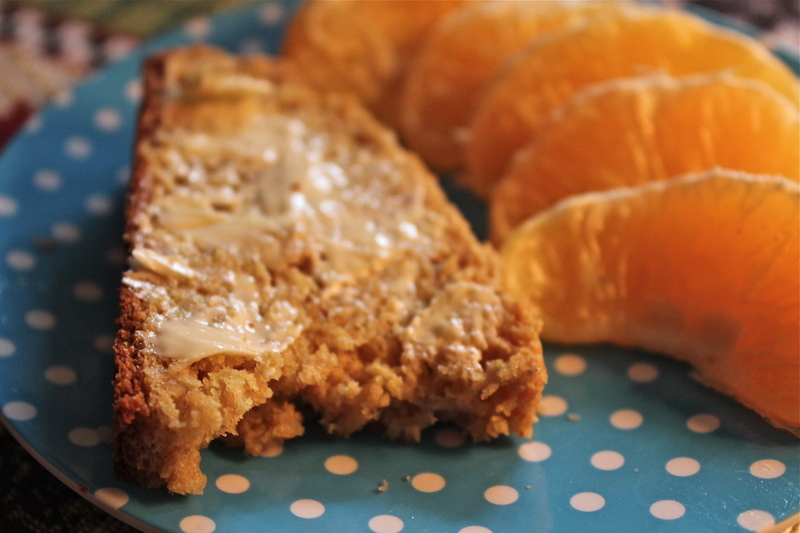 This bread is best served warm with lots of sweet butter to slather on it. Butter melts into the warm bread—-good beyond description! 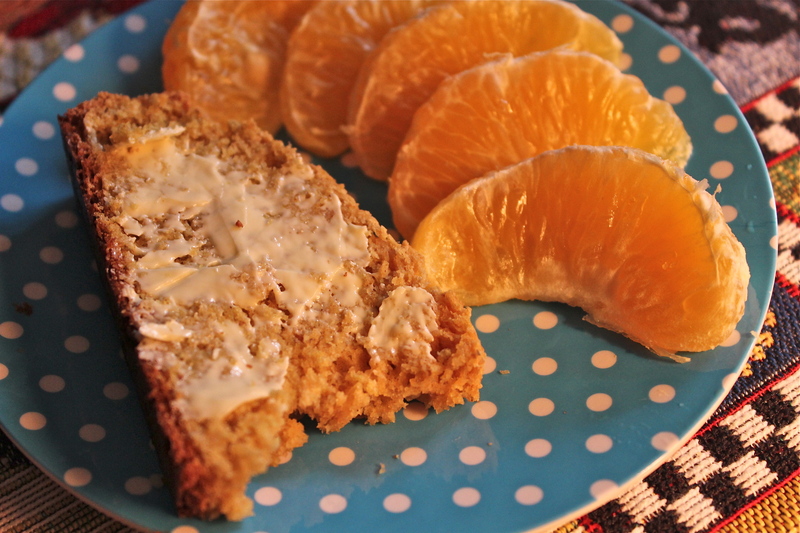 I like that it makes two loaves, one that I freeze for later, and one that we eat right away. 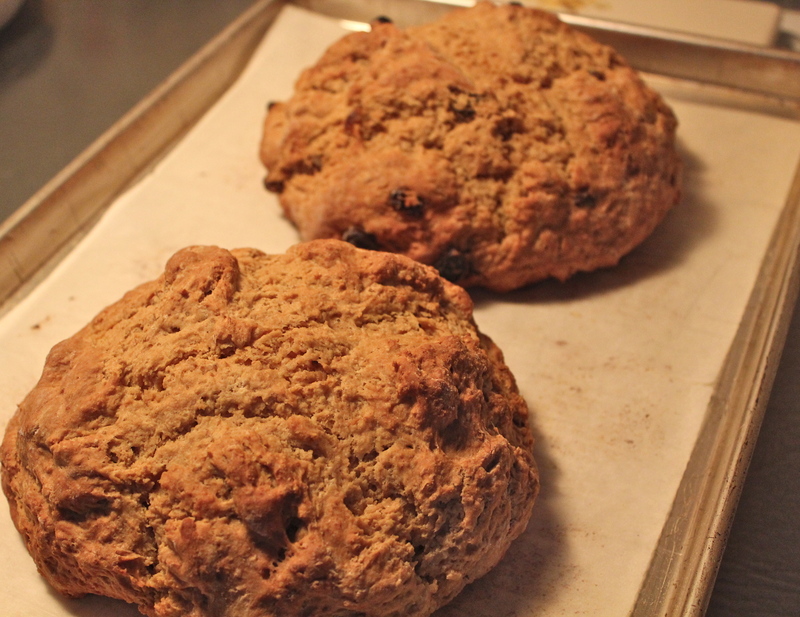 This time as I made them I added raisins to the dough for one of the breads, just for some variety. 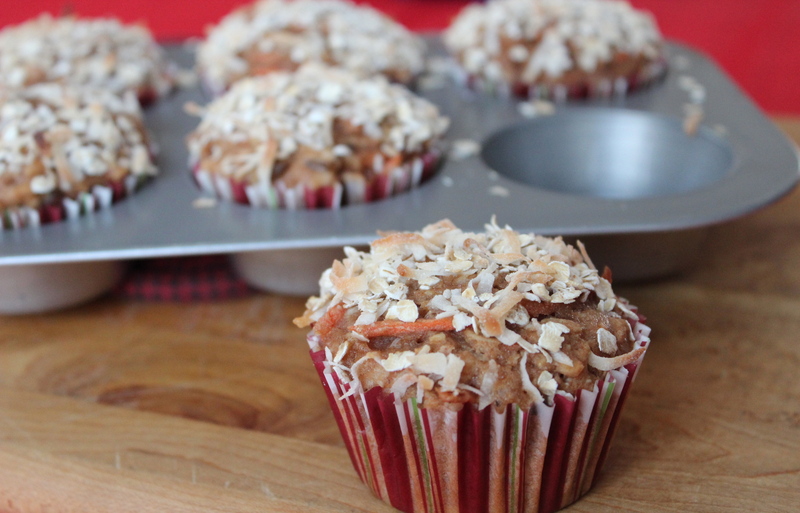 Either way they are delicious with a tender crumb almost like a muffin. 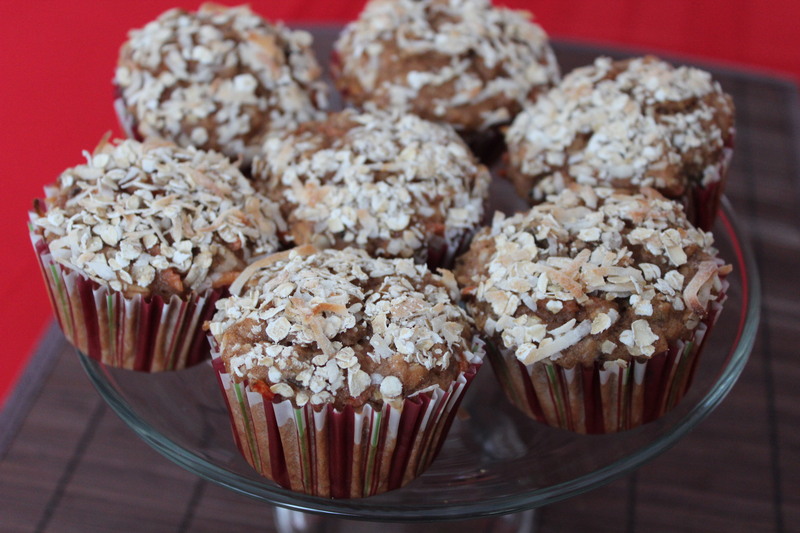 The texture is similar to a muffin.